I’ve been putting off writing this post because it’s difficult for me to go over my memories and images of this time all over again. At the end of January our cat Boo, one of our 2 oldest, got really sick. The first response from the vet was that his kidneys were failing. I feared the worst and cried my eyes out. The vet was trying what they could for Boo, and I knew I had to visit him as much as possible to keep his spirits up. The first time I saw Boo he was grumpy. He growled even at me like he didn’t recognize me. It took me a few times calling his name for him to realize I was even there with him. Then he was just quiet and looked at me. I gently petted him after making sure he was okay and realized who I was. I stayed for a bit and then I had to leave as the vet was closing for the night. The second time they took me to Boo’s cage in their basement. Boo seemed depressed. 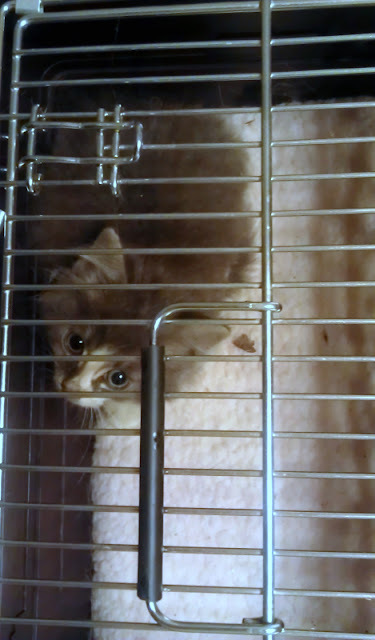 He was lying in the back of the cage. He had peed on the newspaper back there and he was just lying in his urine. I softly called to Boo as I played some soothing music on my cell phone. I also brought a cat brush and started brushing his fur, trying to cheer him up. I asked my husband to visit Boo in the mornings and to bring the brush too. I was really worried that Boo would just give up. I wanted to do everything we could to lift his spirits, to remind him that we were still here and we still loved him. Over time Boo did fight back. He was diagnosed with a bad UTI which lead to the kidney problems. The good news is that, as far as we know so far, Boo has no lasting damage to his kidneys. However, at the same time, we found out Boo was diabetic. The vet gave us some long-acting insulin to take with his meals twice a day. Boo also needed to be on a special canned diet for his diabetes. Boo came home and improved. Then days later after Boo’s breakfast, my husband found Boo unresponsive. Thinking quickly, he made some sugar water and ‘fed’ it to Boo. He responded and when I got home from work I took Boo to the vet. His blood sugars were very low. So I had to leave Boo for a few hours while the vet gave him glucose until the insulin shot wore off. The vet discontinued the insulin, but he still needed to be on a special diet. Eventually, Boo’s diabetes got better and we were able to get him off the special vet canned diet. He still needs a canned diet now, but at least we can buy stuff off the shelves instead of special food with a prescription. He can’t have anything with gravy, just pate and flaked canned food. No more dry for Boo because it has so many carbs. And of course this meant all of the cats went to eating canned food for now on. I’ve been grateful every day since Boo came home that he’s still with us. I spoiled Boo before, but now I pet and whisper to him when he snuggles up to me. Boo follows me around the house still, not wanting to be alone. The poor boy just went through so much. I can only hope he doesn’t have any more major health issues. The kitten has been named Strider after the Lord of the Rings character. He’s this mysterious kitty, with mysterious origins, who was found in our garage and there’s a wooded area near that part of the house. When we took him to the vet on July 9th he weighed 3.5 pounds. They said it was over twice the weight he was last time. Apparently he was actually about 1.2 pounds when we first found him and brought him in! O_O!! Strider has since proved himself to be scary smart. We put two barrier gates in the hallway, one on top of the other. 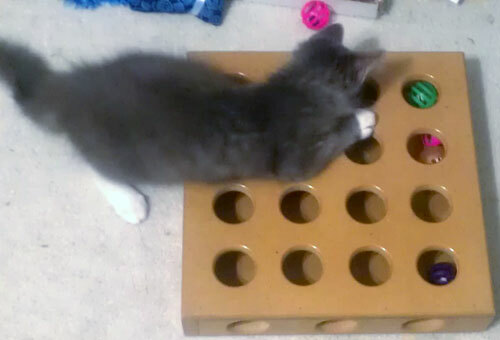 It only took him a couple of attempts before figuring out how to get over them. We moved a foam mattress into a hallway and put it on its side. Strider figured out he can climb on top of it, walk around up there, and peer into other rooms from on top of it. He also loves this puzzle cat toy box we have. 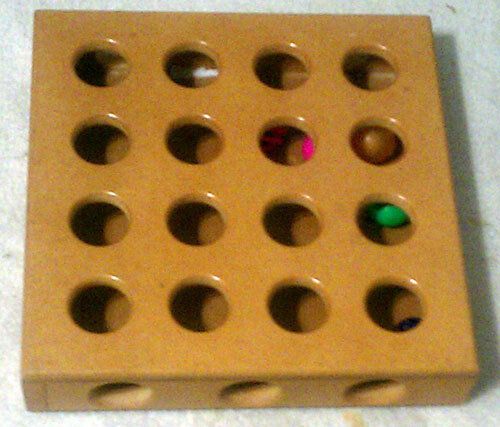 It has holes in the top and sides for putting toy balls in it. He bats them around to fish them out. I put the balls back in, and Strider is after them again. Just today I saw Strider playing with a catnip toy. It’s the first time that a catnip has interested him. So hopefully he’s starting to react to catnip now. The other cats are still getting used to him. Our oldest cat Kit continues to avoid him completely. Crystal (our 2nd oldest) tolerates him, which is interesting since she too was a feral kitten. Emily, now our middle child, does not like Strider. Emily makes a point of trying to smack Strider from time to time, which is an improvement over hissing and trying to strike. *Sighs. * The youngest, the brothers Kero & Boo, like to watch Strider with keen interest. Once again it’s interesting since they are the only other boys we have. Boo has taking a bit of a liking to Strider. 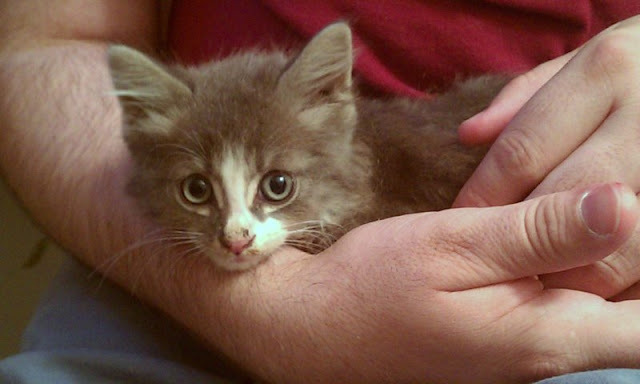 You may recall Boo was the one meowing down the stairs, making Strider cry out in return while he was in the garage. They’ve had an interesting relationship so far. There was a time Strider would instantly come running to Boo the moment he heard Boo meow, or Strider would meow in return. Kero did not like Strider and hissed a lot. He’s become a little bit more tolerant of Strider now, to a point of course. Strider still gets frightened of things. He’s been getting better. He used to jump or run away when you tossed a toy near him. He was also afraid of the food bag. Strider still runs away and gets startled easily at times. I’m hoping he’ll get up his courage soon. The other problem is that he still have fleas. The vet gave us some flea treatment, but Strider still scratches. The other cats have started to scratch too. I’m also covered in flea bites on my lower arms and legs. (My husband is unscathed. Lucky.) Strider is due for a re-treatment and we bought flea medication for the other cats. So hopefully this will be finally dealt with soon. Other than that, Strider likes to meow a lot. I guess that’s what we get for having 3 cats that are part Siamese. Strider probably thinks this much meowing is normal. Heh. I’ve heard that bad luck comes in threes. I just didn’t want this to be the third..
For quite a while now Muffin had been getting thinner and thinner. She doesn’t eat much. Even then sometimes she throws it back up or has loose bowels. My parents are leaving, as I am, to my brother’s wedding this weekend. They’ll be gone 5 days. They worried that by the time they got back, Muffin would already be dead. So when my mom first told me all this on Sunday night, I had to decide if I wanted her buried or cremated. Among all my tears and sobs, I had to make a decision I have been dreading for years. When I was last at my parents house before my move to Georgia, I hugged Muffin and said my goodbyes then. I knew I would probably not see her again. I thought that would help heal my pain. But it didn’t. I wish I could be there now, today, when she finally gets put to sleep. I had decided it was best to put her to sleep and end her suffering. Muffin isn’t getting any better. Also we wouldn’t be wondering if she’d still be alive when my parents returned home. I also decided to have her cremated. I had promised Muffin that I would show her my first house years ago. I had to break my promise because by the time I was about to move into this house, Muffin had gone deaf and she was already starting to get thin then. At least up in CT she had a home she knew and a vet who knew her. I figured that was for the best for her. But if I had known it would be less than a yr later that this would happen.. I may have thought twice about it. So anyway I figure this way I can bring Muffin’s ashes to my house, give her a spot in it, and keep my promise to her. This whole thing has wracked my emotional well-being all week long, like giant waves crashing into a cliff. I’ve been sleeping poorly, and my work is starting to be affected by it all. I’m having a difficult time keeping tears at bay. The worst part is that Muffin has been holding on all this time. I wonder if maybe she thought I was coming back home. She always did follow me around the house and outside the house. If I was crying she came up and comforted me, even if we were outside. She was my friend when I had none. Maybe if I came home she would have gone in her sleep, content. Yesterday while talking with my mom and making the final decision, Muffin was sitting in my mom’s lap. She put the phone to her and Muffin was purring. That just killed me right then and there. She has no idea what’s coming. There’s so much more I can say about this and about her, but unfortunately I have to head to work now. I just wanted to type something up about her before I knew she would be gone forever.